Hello! A quick post (with tons of pics!) 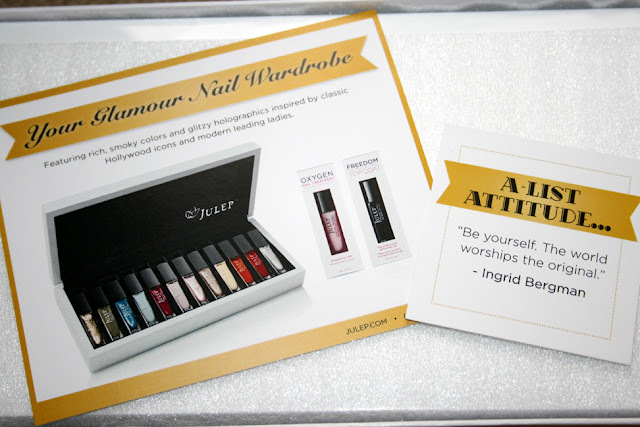 detailing what I received in my February Julep Maven box. This months theme was based around the Oscars and leading ladies. Both, past and present. The upgrade this month was $35 instead of $30. That is in addition to the $19.99 Maven monthly club price. I of course, jumped at the chance this month to update for $54.99! Why? Because it included the jewelry box! And "Oscar" which I didn't have yet but did want! So, if you upgraded it didn't come packed in all the gold and glitzy tinsel that everyone else's did...but that's okay. 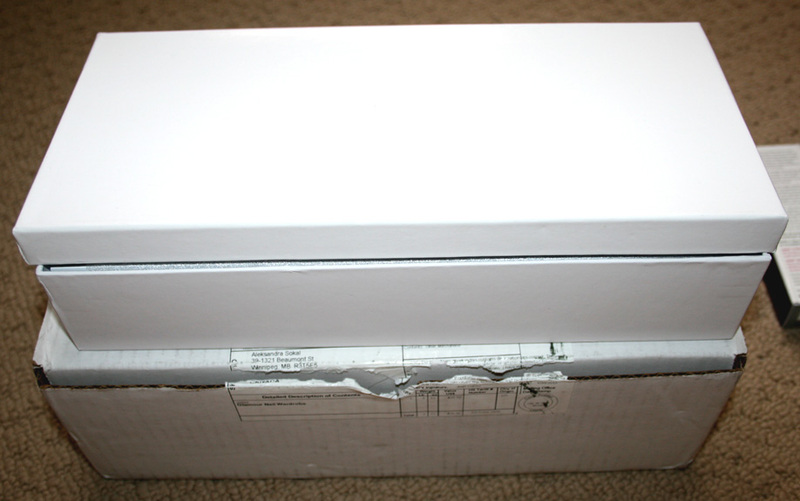 Inside the shipping box was another box, kind of like a shoe box. This is what the jewelry box looks like. 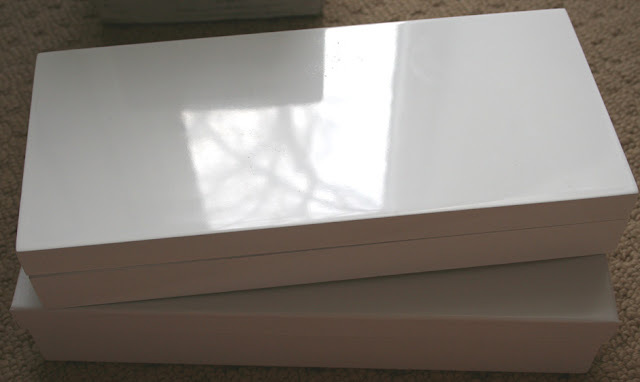 It feels like melamine and is a nice modern looking box. It has a little handle you flip down and squeeze. Just a quick try and it seemed to do a decent job! 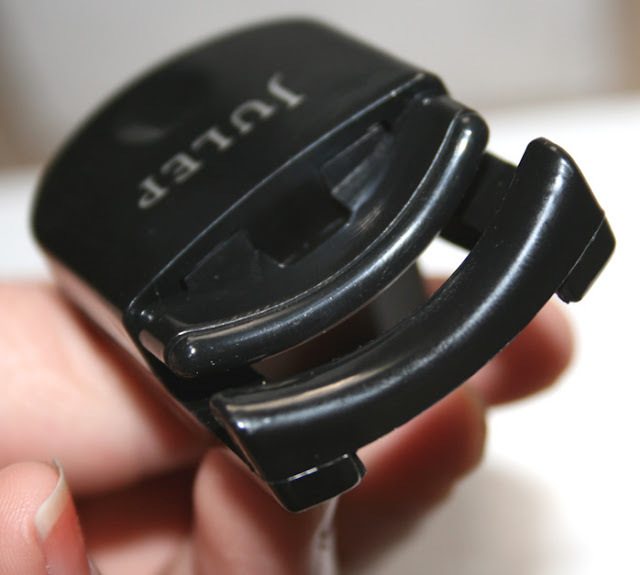 In case you didn't notice, the bottom of the curler has an extra rubber cushion for the curler! The first of two products received is the Oxygen Nail Treatment. Retails for $18.00. The bottle is a little empty because I've done two treatments with it now... and at first I thought I was happy because the nail looks gorgeous when it's applied. But, after the second treatment my nails started cracking and separating in layers! I just took it off today and I'm not impressed at the state of my nail tips. I'll leave it off for a day and keep trying to see if it just needs to work on the new growth. But, as of this point I'm angry that my nails are WORSE! Just a note this stuff goes on like white school glue, I find you have to work relatively quick with it. The product is supposed to make your nails stronger, thicker and smoother. 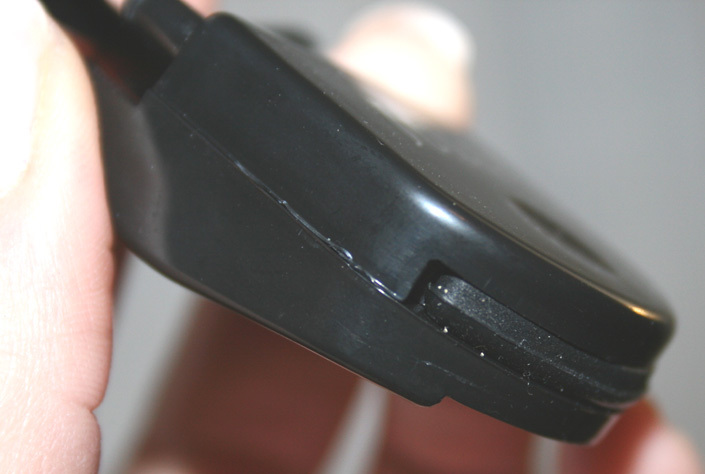 It's supposed to make your nails less prone to breakage and splitting. So far, NOT impressed. You're supposed to use it once or twice a week and you are not supposed to put polish on top of it. The second product is the Freedom Top Coat. Retails for $18.00. This isn't something that I've tried yet, so I can't comment. I was really hoping to get a good use out of the above product, get healthier nails and then move on to this product. The boxes are really cute...not only are the fronts embossed with the Julep logo, the sides of them are decorated too. 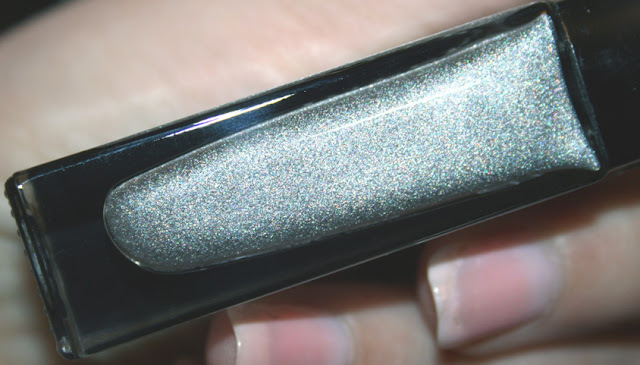 The top coat has little words depicting the product and Oxygen Treatment has little O2 symbols. Too cute not to share! Julianne - smoky grey-blue creme. Laura - olive khaki creme. Helen - smoky pastel lavender creme. Sally - antique ivory creme. Marion - smoky blue with silver shimmer. This is a more accurate picture of the colour. It's gorgeous! You can see the silver swirled throughout! 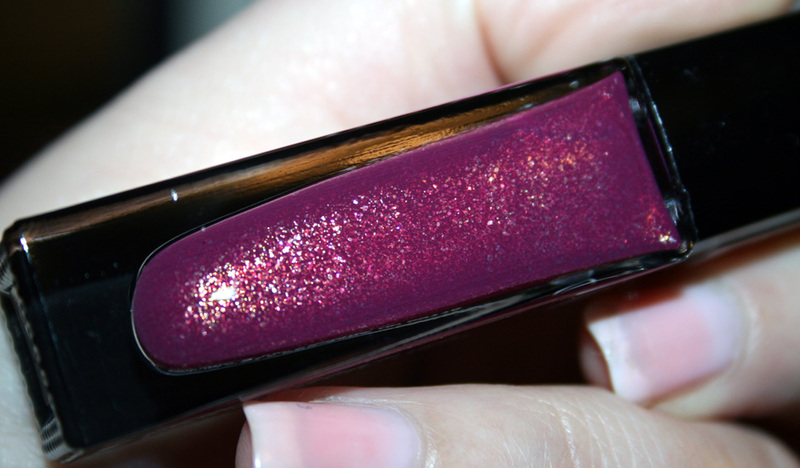 Joan - raspberry plum with rose gold shimmer. I haven't tried this holographic yet...but I'm super excited to! :) I'm so happy that these were included in the boxes! 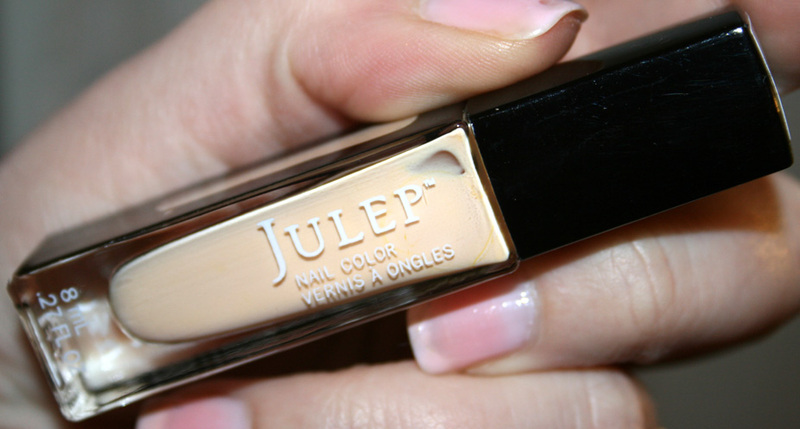 Ok, now on to something else by Julep. 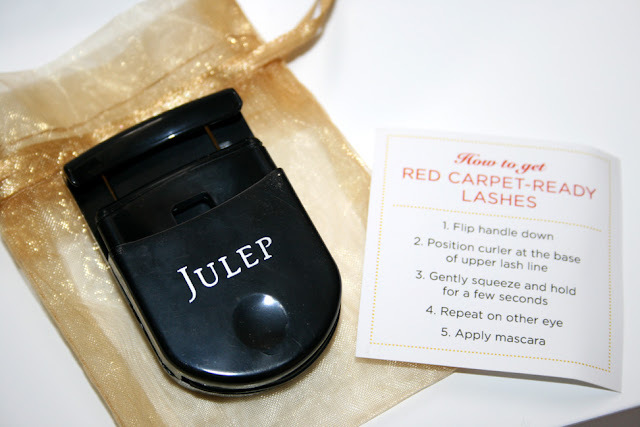 I didn't really feel like making a whole separate post about this, so I thought I would include it here, since I'm already doing Julep! About a month or so ago, Julep did a two for one deal. 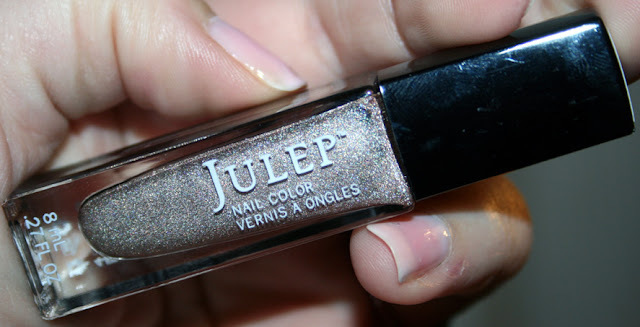 So, because I wanted Jane (the glitter) I decided to scour the site for another colour that I think would be a must have. I came up with Marisa (the blue.) 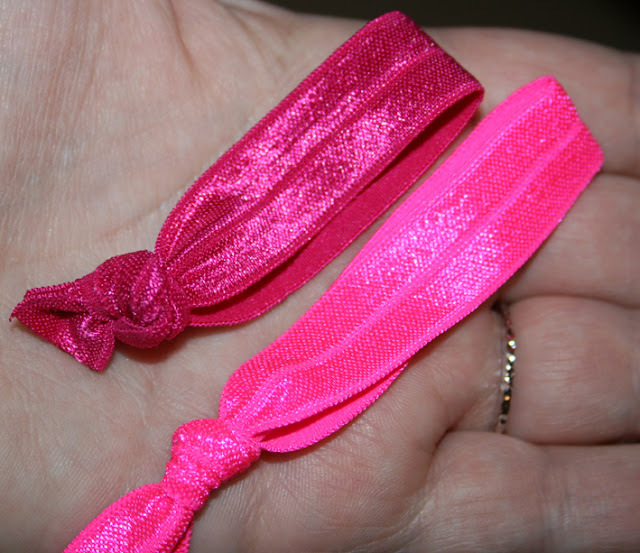 We were able to buy them both at the Maven price, so $11.20 for the pair shipped. 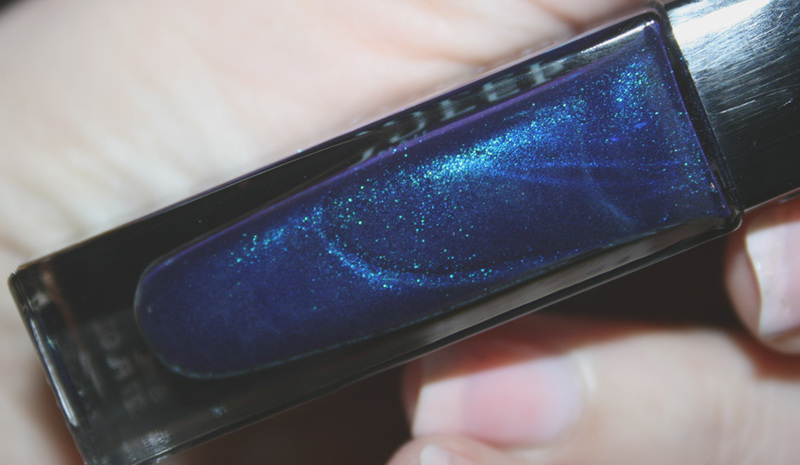 Marisa - dark, rich cobalt blue shimmer. I know it looks super blue here but it's one of those colours that transforms green to blue in the bottle. It's SOOO incredibly gorgeous! I'm glad I picked it up and it wasn't what I was expecting, so I was pleasantly surprised! 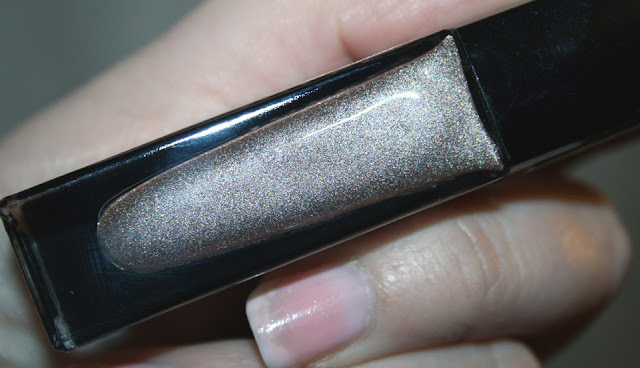 Jane - rose gold multi-dimensional glitter. Full coverage. Well, I should have known better! When Dakota came out they claimed it was a metallic rose gold..and it wasn't. Well, this glitter isn't either. There are two sizes of glitter...the larger hex ones are pink and the teeny ones appear to be copper. So...it's not quite what I was hoping for. It is pretty though, so can't complain. It no way looks like it appears on their site, though! So, one last little side post. 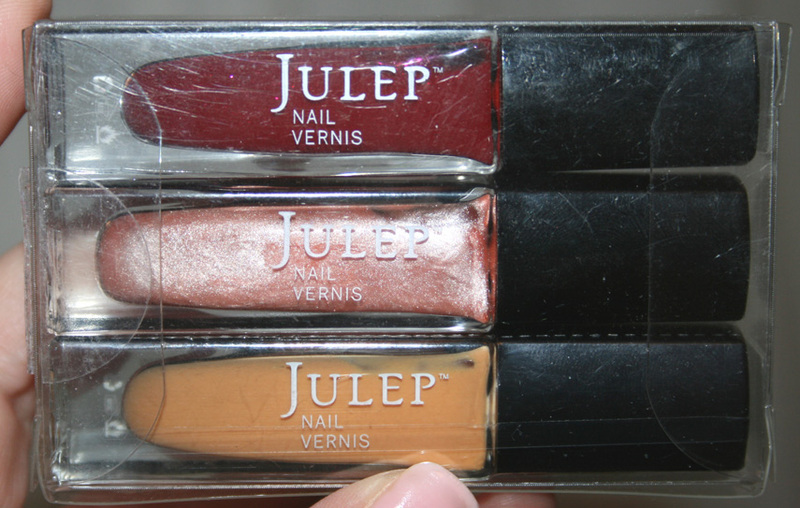 :) I have a wishlist of Julep polishes and my friend Polish Jinx had some dupes, so I bought the following from her, top to bottom: Gwen, Maya, Stella. 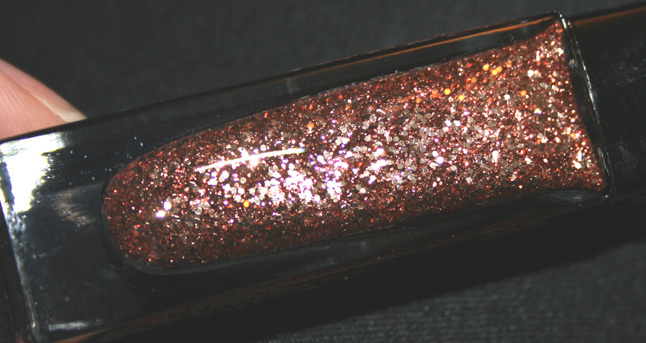 Gwen - glamourous deep red shimmer. This is the perfect red colour. It's a blood red and it has red micro glitter. I have a feeling this will become a favourite for me! Maya - peachy pink seashell, like a shimmer pearl. Stella - mustard yellow creme. Well, I was expecting it to look a little more like in the picture..but well, it really is mustard coloured! I'm not sure I like it yet, I'll have to see it on my nails. Also, since I skipped the February box, Polish Jinx also gave me the hair ties from her January box. Not only that, she gave me some she picked up at Dollarama. As you can see they're similar. The dollarama ones are just slightly smaller. I've tried finding these on my own and haven't been able to! 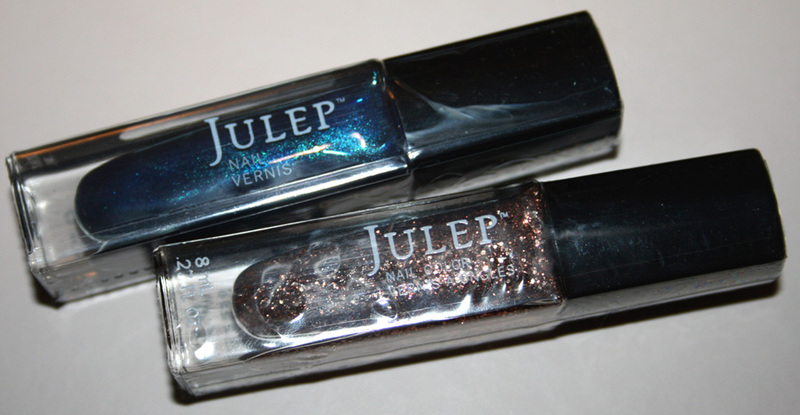 Here is the comparison of the dollarama and Julep ones. 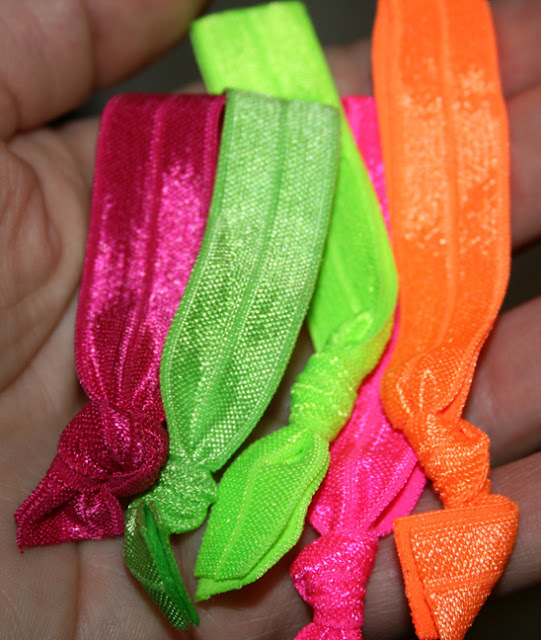 The dollarama ones have more stretch to them, so it may not matter that they're smaller. But, they are basically made of the same thing as you can tell from the centre line of the band. and i guess i HAVE to get Helen! Holy poo thats alot of polish! LOL Marion is gorgeous. Lol, I know right...overwhelmed much? haha Marion is gorgeous!!!! Yes...in fair, medium and dark!!! I think you can only get them at Sephora or online from benefit. But, the shipping is and always has been ridiculous on the benefit site! Wow that is alot of nail polish..
1. Glenn 2. Rose 3. Sharon 4. Petra 5. Lucy 6. Gayle 7.Nora 8. Evengeline 9. Susie 10. Eileen All are sealed other then Rose & Susie in which never was. Oooh, I wonder how much shipping would be on those. I know for sure that I would like Rose and Evengeline! I may have all the others! I am so going for the benefit sets soon! heheh...I know it's hard not to grab everything...we should have been born rich instead of beautiful!